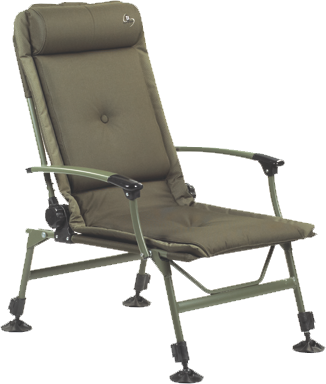 Luxurious carp chair with armrests: cloth made of dark green 600D polyester material with waterproof PVC coating. 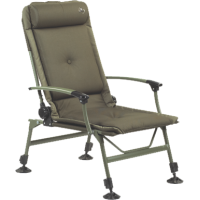 Luxurious pillow at the top for maximum comfort + extra cushion on the back and buttocks, the rounded aluminum armrest is adjustable in different positions. 4 telescopic legs, bottom with tilting mud feet. Frame ø 25 mm aluminum tube construction.